Espresso has long been seen as a drink to be enjoyed by the upper class and is something that couldn’t be made correctly without using some expensive coffee making equipment. That just isn’t true anymore. That’s because coffee connoisseurs no longer have to take out a mortgage to pay for an expensive chrome-covered espresso device. They can enjoy one of the inexpensive espresso makers available and pull themselves a perfect cup. All without the expense of traditional machines. 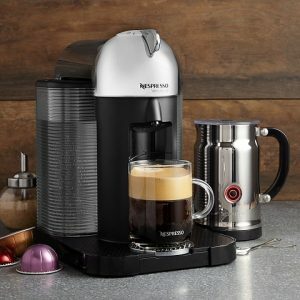 Yes, cheap espresso machines are currently available to anyone interested in brewing this beverage in their own kitchen. Affordability isn’t the only reason to buy one of these machines, however. Below is a selection of just some of the machines that we find to be really exciting. These machines are functional, affordable and will help anyone widen their coffee horizons. Not only does this product allow the user to prepare delicious shots of espresso but also allows the user to make cappuccino and latte as well. It has an Italian pump that delivers up to 15-bars of pressure and allows the user to extract espresso and to make a rich crema. This machine also has a swiveling steam wand that allows milk to be steamed and frothed for a truly authentic coffee experience. It can also be used with either espresso pods or with coffee grounds. Other features which make this a good low-cost espresso machine is a removable water reservoir, a cup warmer and a removable drip tray. The Nespresso Vertuo Plus Deluxe takes all of the guesswork out of crafting an excellent cup of espresso. It offers the user three different cup sizes: a 1.35-ounce size, an 8-ounce size, and a 14-ounce size. The user simply has to use a small capsule for making espresso or a large one for making coffee. This product also uses a patented extraction technology called Centrifusion that rotates up to 7,000 RPMs a minute. This blends water and coffee grounds together perfectly to allow for incredible espresso flavor in each shot. This makes this device a great gift to give yourself or to the espresso enthusiast in your life. Although this low-cost espresso maker isn’t technically a machine, it is one of the more inexpensive ways of creating an awesome cup of espresso. It’s constructed of 18/10 stainless steel, including all of its interior parts such as the filter plate and its funnel, so it’s designed to be as durable as it is easy-to-use. It has a 4-cup capacity, and it sits right on top of a person’s stovetop, always ready to craft a nice shot of espresso. While this method of brewing espresso is a little more labor-intensive than other espresso makers, it can have a nice cup of espresso done in approximately 5-minutes. This economy espresso machine uses 800-watts of power to brew up to 20-ounces of espresso coffee. It also has the features which allow it to make quality gourmet drinks. It comes with an easy-to-use portafilter, a filter basket, tamper, glass carafe and cover. All of which makes it even more of a value to the coffee consumer. This product is manufactured to the highest of quality standards and is designed to deliver hot, fresh and tasty coffee each and every day. Anyone looking to make high-quality European espresso may want to take a closer look at this inexpensive machine. With a compact design, this low-priced espresso machine can be placed easily into almost anyone’s kitchen and provide them with one tasty cup of coffee after another. It has a 24-ounce tank that reaches ideal water temperature in under a minute and can deliver up to 9 single-serve cups of espresso. This energy efficient machine can also switch itself off after 9-minutes, so it doesn’t run up the homeowner’s electric bill. Other features found on this espresso maker includes the ability to generate up to 19-bars of pressure, a moveable drip for large cups, and one-touch operation. This affordable espresso maker isn’t technically a machine, but it is low-priced and delivers high-quality espresso quickly and easily. This cheap stove-top espresso maker is made from stainless steel and can hold up to 9-cups of coffee. This espresso maker doesn’t require the user to tamp the coffee grounds and can make coffee quickly and efficiently. It can be used on gas, electric and ceramic stoves, and can even be used on camping stoves during hunting trips. This product can also be easily cleaned out so that it’s quickly ready for another day of coffee making. It’s a budget Moka pot that makes an excellent cup of espresso. This automatic and portable espresso maker allows the coffee drinker to make a great cup of espresso literally anywhere they go. It only weighs around 1.45-pounds, yet it can extract coffee with 16-bars of pressure. It can be plugged into a portable battery pack or a wall adapter with the included USB cable. Once it’s setup and ready to use, this product can deliver a hot cup of espresso in under a minute. It comes with a reusable stainless steel filter and can be used with either coffee pods or with grounds. All of which makes it a useful tool for the busy coffee enthusiast on the run. This affordable espresso machine doesn’t require a battery or electrical power to operate. All a person has to do to operate it is to put grounds in its filter, add hot water and then push the pressure pump to operate the machine. And that’s all there is to it. This little machine is capable of delivering a hot cup of espresso at home, at the office or even while camping. This product comes with the main body, a water tank, a filter basket, a pre-measured scoop, an espresso cut, and a carrying bag to put everything in. Now, anyone who needs a cup of coffee can have one no matter where they are. This high-quality machine can heat water up in 30-seconds and be ready to quickly make espresso. It uses a Nespresso capsule system, so the user never has to mess with grinding and tamping grounds and has a decent-sized 20.3-ounce water tank. After 9-minutes, this machine will power off to save electricity and has an intuitive design that makes it easy-to-use. It also comes with a welcome kit of 14-exciting Nespresso capsules so the user can find out exactly what this machine is capable of doing. And all of this makes this machine good for any espresso fan or as handy holiday gift to a loved one. This multifunctional espresso maker can make espresso, cappuccino, latte, and coffee quickly and efficiently. It delivers up to 15-bars of pressure and has a built-in steam wand. Its removable water tank has a 41-ounce capacity, and it’s easy to remove and refill. This machine is also equipped with two separate thermostats—one for steam temperature and one for water temperature. This product comes with a coffee mug, two filters, and a plastic measuring spoon. That’s everything an espresso aficionado needs to make themselves a hot, tasty cup of espresso. And it’s all delivered at a price that will pay for itself in no time flat. Now that you have a cheap espresso machine, what do you do with it? Well, the first thing after you’ve unboxed it that you should do is to read the instructions that came with it. Make sure that you have read it from cover to cover, especially the parts that cover proper use and safety of the machine. Once you’ve done that, however, you may still wonder how to make a perfect cup of espresso. If that’s the case, then read on because we’ve assembled a quick guide to making espresso at home. There are some things that may have been overlooked by your machine’s instruction guide, such as water quality, coffee grind, and water temperature. And we’ll explore those particular topics in this guide. With that being said, however, it should also be stated that manufacturer’s instructions should take always take precedence over any espresso guide – including this one. Having said that, let’s get started. The first thing that should be considered before making espresso is the quality of the water. You want to make sure that you don’t use water that tastes bad or are packed full of unwelcome minerals. Too much chlorine in municipal water supplies can adversely affect the taste of your coffee as well as the musty taste of some well water systems or water that’s extremely hard. Water quality can usually be improved with the use of a carbon filter, but sometimes more drastic measures have to be taken such as buying purified water. Trust me, the better tasting the water used to make your espresso, the better the espresso is going to taste. There is one thing to keep in mind, and that’s the fact that many espresso machines caution against using distilled water. That’s because distilled water can degrade metal over time and cause it to fail. And that’s a good enough reason to make sure that your water has some minerals in it. Not to mention the fact that water usually tastes better when it has a healthy mineral profile. While some inexpensive espresso machines use pods, most of them allow you to use your own espresso grinds. While you can certainly use already ground coffee, if you want the highest quality espresso possible, then it’s better to buy a grinder. Grinding your own coffee is absolutely the best way to get the best shot of espresso. There are grinders made specifically for grinding espresso coffee, but these can sometimes be expensive. Not to mention the fact that there’s a lot of variables to take into account. This includes whether the grinder is a stepped grinder, what kind of burrs it uses and whether or not to does. However, none of those things are necessary for a great shot of espresso. The important thing to remember is to buy a grinder that makes a consistent grind. An espresso tamp is another thing a person may want to consider when making espresso at home. Whether or not you use one depends on whether you’re shooting to make the highest quality of espresso possible or not. If you’re just making a pedestrian shot of espresso – meaning that it’s nothing special – then don’t worry about buying a tamp. On the other hand, if you’re trying to produce a high-quality shot of espresso, then you’re going to have to buy a tamp. What does a tamp do? Well, it compresses the grounds so that it takes water to filter through them. This encourages a little more interaction between the coffee grounds and the water, so you end up with a stronger shot. A tamp also allows for a more even extraction of the espresso. True espresso is made with tamped grounds, but you can still make a pretty good faux espresso without tamping. Ultimately, the choice is yours. Buying a temp is relatively painless though. They aren’t very expensive at all. Just make sure that your espresso machine supports the use of tamped espresso grounds. If it doesn’t because it uses pods or something like that, then there’s no point in even worrying about buying one. Most automatic budget espresso machines set the temperature of the water to the ideal temperature for espresso extraction. This is a temperature range between 190-degrees and 205-degrees Fahrenheit. If the particular machine you’re using allows you to adjust this temperature, you can always experiment with it a little bit and choose a temperature that makes your perfect cup of espresso. Fill the Machine Water – Make sure the water used is clean and great tasting. Also, ensure that it’s cold water and hasn’t been preheated. 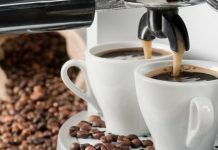 Heat up the Machine (If Necessary) – If you have an automatic espresso maker, then you’re probably going to have to fill it with coffee grounds before turning it on. However, if you’re using a standard machine for espresso, then you have to give it time to heat up. Grind & Dose the Beans – If you’re grinding beans for your espresso, then be sure to grind them now. Make sure they have an even, powdery consistency. Once they’re ground, dose out between 18 to 22 grams of coffee into your machine. Tamp Down the Grounds – Evenly and firmly tamp down the coffee grounds into the filter. Add the Filter to Machine – Once the grounds are tamped, place the filter into the machine. Begin Extraction – Once pre-infusion has been completed, you can proceed with extraction. Once extraction has been completed, transfer the espresso to another cup and add your finishing touches. Congratulations, you’ve just made a fine cup of espresso.